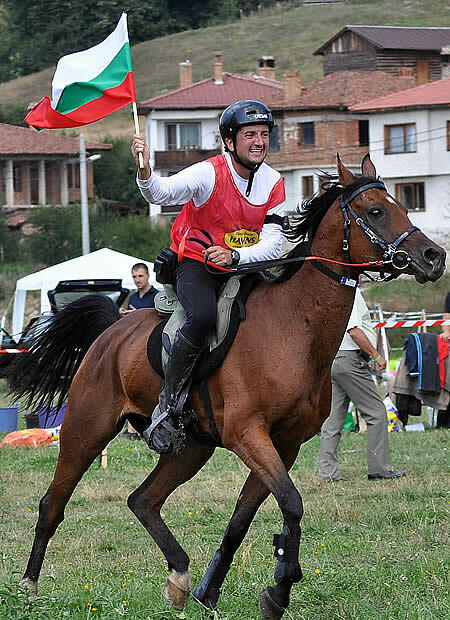 Lausanne (SUI), 30 August 2011 – The host nation scooped team and individual gold at the FEI Balkan Endurance Championships 2011 staged at Koprivshtitsa in Bulgaria last weekend. The Bulgarian side was the only finishers in the three-nation team contest, while Miroslav Borshosh produced an impressive and well-judged performance with his Arab gelding, Munir B, to emphatically claim the individual title. Koprivshtitsa, which lies on the Topolnitsa River and in the Sredna Gora mountains, is well-known for its architecture. and for the folk-music festivals that ensure it is a very popular destination for tourists. It is also home to a National Festival of Bulgarian Folklore which takes place every five years, attracting musicians, artists and craftsmen from across the country. So visitors to these FEI Championships experienced an authentic take on Bulgarian culture and heritage. Poland’s Dr Piotr Szpotanski, a highly-experienced FEI Veterinary Delegate, described the competition trail as “very tough”, but was surprised how well the horses coped with it. “I found it frightening when I was driving the mountain trail in my car, but the horses seemed to find it much easier!” he said. Rumours of wild mustangs running loose through the countryside, and even the occasional wolf prowling in the wilderness, didn’t deter the competitors from the task at hand. And the Bulgarians proved the masters on their home turf. In the team event, three of the Bulgarian side recorded almost identical finishing times – Janina Ivanova (Zezana) stopping the clock on 05:56:26, Maria Jordanova (IBN Galal Sava) crossing the line in 05:56.28 and Ivan Stoichev (Zahir) breaking the beam in 05:56:29, while Kiril Stepanov (Gaucha de Pallares) was just over three minutes further behind. It was a clear-cut and unchallenged triumph. Only two of the Greek team completed, but both of them would be well-rewarded when Efstathia Koutsafti took individual silver ahead of team-mate Evangelia Vlotidu in bronze. The Turkish team of Ekan Demir (Mirliva), Un Ali Ekber (Padisah), Ozden Oten (Duman) and Mustafa Ozer (Ruzgar) all failed to finish. Borshosh’s success in taking the individual title came down to excellent judgement and remarkable skill. The 38 year old, who hails from the Bulgarian capital city of Sofia, has been competing as an Endurance rider for less than five years and, with his 11 year old Arab horse, Munir B, had only completed one 80 kilometre ride prior to these Championships. Yet he timed his progress around the three-loop course so that he had plenty of fuel left in the tank on the final circuit to finish with an average speed of 16.210 kilometres an hour, and an overall average speed of 15.864 km/h. It was Koutsafti and her 11 considerably more-experienced 11 year old Chamelot, who were favourites as the race began. This grey mare previously competed under the Italian flag and has two 120 km runs under her belt, but this was the first big test with her latest rider and their average speed of 14.917 km/h left them well behind the gold-medal winning partnership. Koutsafti’s average speed of 11.840 km/h on the final loop was only slightly quicker than compatriot Vlotidu’s result with another former Italian horse Giorgia Delle Corse whose overall average speed of 14.729 was good enough to clinch the bronze. Their last-loop efforts however only served to accentuate the superiority of the champion, whose horse was full of running to the very end. And the next four places, from fourth to seventh, were battled out in a racing finish between Bulgarian team gold medallists Ivanova (4th), Jordanova (6th), Stoichev (7th) and Croatia’s Petra Sebelic riding Wolf, who slotted into fifth place. Riders from six nations – Bulgaria, Greece, Croatia, Romania, Turkey and Serbia – competed at the event. FEI Technical Delegate, Bo Kjelleren, was delighted with the way these Championships were conducted. “It was a fantastic ride, and the organisation was very professional,” he said. “The event ran smoothly and there was a great battle for the medals – it was an excellent challenge for the riders, who looked after their horses very well,” he added. Team Championship: GOLD – Bulgaria 17:49:23 – Zezana (Janina Ivanova), IBN Galal Sava (Maria Jordanova), Zahir (Ivan Stoichev), Gaucha de Pallares (Kiril Stepanov). Individual Championship: GOLD – Munir B (Miroslav Borshosh) BUL 16.210 kmh; SILVER – Chamelot (Efstathia Koutsafti Efstathia) GRE 11.840 kmh; BRONZE – Giorgia Delle Corse (Evangelia Vlotidu) GRE 11.900 kmh.